I wanted to name this post ‘The art of water fern cakes’ but I left it out. It can be more specific as the art of making, yet to me it is actually the art of enjoying water fern cakes. The secret of making the cakes is the right proportion of rice flour and tapioca flour, in which rice flour should always be more than tapioca flour; then the right time of steaming. I indeed failed to make these water fern cakes for two times, but the third time, I was successful. There is no actual recipes according to me since the flour bought can be different everywhere, less alone you can buy the ‘banh beo flour’ which mix everything for you (*). My preference for ‘banh beo’ probably comes from the fact that I have a Hue blood in my body, and lived in Da Nang for more than 17 years. To explain, there are basically two version of the Vietnamese water fern cakes: one from Hue and another one from Quang Nam (Da Nang used to belong to Quang Nam). I think the main reason I prefer Banh beo Hue is because they are served in a small saucer. They look beautiful to me and the fact that I hold something carefully, gently scooping the small cake, together with the topping and fish sauce just in one spoon is a nice act of eating to me. The topping shrimp is not finely ground so you still know that it’s made from fresh shrimp. It is called ‘banh beo nhan kho’. 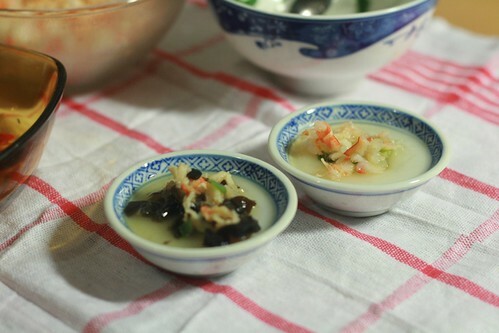 ‘Nhan kho’ means dry topping. The Quang Nam version is a mix of chopped shrimp, pork belly, wood ear mushroom. 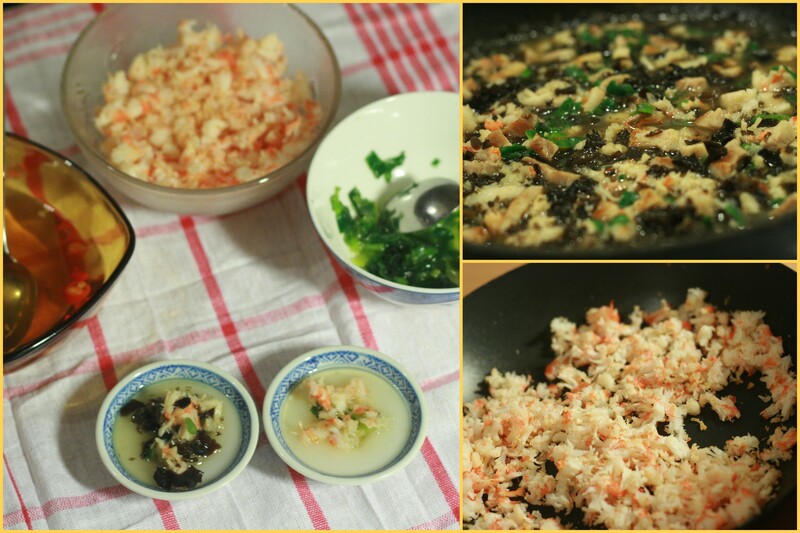 Everything is sauteed than adding water stirred well with tapioca flour. Thus the topping is mushy and is called ‘banh beo nhan uot’. ‘Nhan uot’ means mushy or watery topping. As a child, I had my preference for the dry topping because the other one was mushy, I didn’t see where the shrimp was. My recent urge to make ‘banh beo nhan uot’ probably cames from the fact that I spent my childhood in Da Nang, not Hue, and that my grandfather liked ‘banh beo nhan uot’. He is a ‘role model’ or something like that to me, a very good father and very good grandfather. I now like the fact that I enjoy things he used to enjoy. 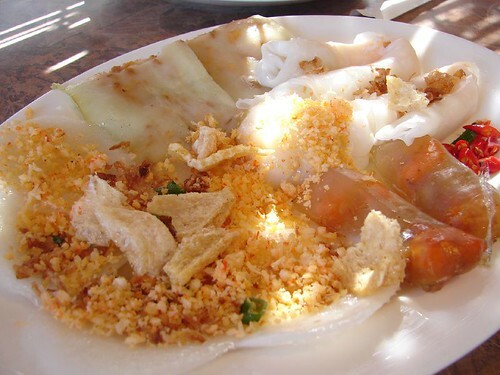 ‘Banh beo nhan uot’ is really another way to enjoy a variety of regional dishes. It is so central of Vietnam that people sprinkle chopped peanuts in it. Hue version looks like an elegant one, with not too much things in it so you can enjoy the ingredients, I like the saucer being small so that you have to be mindful when eating. The surface of the cake is greased with scallion oil, then put the roasted shrimp crumble on top and a fried piece of pork skin. Being served in a small portion is something really of being ‘imperial’. As Hue was the last imperial city of Vietnam, everything that was eaten by the king or the royal folks are thought to be small, lots of food on the table but in small quantities to show elegancy at the table. Hue food in Vietnam is known as the most spicy but also the most tasty, and elegant food across the country. Quang Nam version is more of a comfort food. The topping is warm, a bit runny. With the peanut and fish sauce in it, it gives you everything that you can expect for, softness, warmth from the little cakes and the topping; crunchiness and nuttiness from peanuts, covered in a lightly tangy fish sauce. 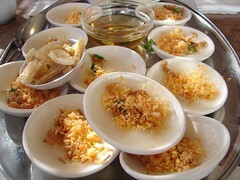 Banh beo Quang Nam is a popular snack for every class of people. It is often served in plate with fish sauce on top or in a bigger saucer than Banh beo Hue. Girls still need to divide the cake into 2 or 4 parts to be an elegant person (or elegant eater, I would say). In Danang, ‘banh beo’ is eaten for breakfast, among various things for breakfast such as Pho (beef noodle soup), bun bo Hue (spicy beef rice vermicelli soup), banh mi (Vietnamese stuffed baguette), bun cha ca (fish cake noodle soup), xoi (various types of sticky rice),… However, lots of people enjoy it as a snack, around 4-5p.m or anytime in late afternoon but before dinner. Banh beo is normally sold together with Banh bot loc (Vietnamese transparent dumpling), Banh nam (cake stuffed with minced shrimp and pork). Both Banh bot loc and Banh nam are steamed once covered in banana leaf, Hue style. Thus, people often eat different kinds of cakes once they come to the specialty shop for this. I really miss eating these snacks being hungry after coming back from the beach! (Yes, ordinary Vietnamese go to the beach at 5a.m. or 5p.m to avoid getting dark). (*) In a video from a famous Vietnamese cook, she uses the proportion of 1 rice flour: 1/10 tapioca flour: 1 water. In another recipe that a friend of mine who lives in Finland (whom I can vote for ‘the best Vietnamese home cook’ if there is such price), the proportion is 1 rice flour: 1 tapioca flour: 1 1/2 water. I was afraid this was too much tapioca flour but probably the types of flour used in Vietnam and abroad are different. Another recipe that I find using 400g rice flour, 100g tapioca flour and 1l water. Still, I find it a bit too soft. So, finally I managed to test and write my own recipe here. This is my entry to Delicious Vietnam #19, a monthly blogging event celebrating Vietnamese cuisine which was started by Anh of A Food Lover’s Journey and Hong & Kim of Ravenous Couple. Thanks to Ginger from ginger and scotch for hosting the event. This entry was posted in Appetizers/ Salads, Vietnamese and tagged fish sauce, rice flour, shrimp by QA-no9blue. Bookmark the permalink. i love banh beo, the whole process of eating it. i have never put much stock to the actual art of making it, nor was i even aware that there was an english translation for it. which recipe did you end up using? Last time I ended up testing from using 2/3 to 3/4 cup of tapioca flour over 1 cup of rice flour. All gave ok to good results. I didn’t know exactly since I made it at my boyfriend’s place and he doesn’t have a measuring cup or measurement things. Will try it again at home to write a proper recipe, but the tip of cooking is to pour a thin layer of the rice and water mixture, and steam the saucer first. ciao! I am an italian who fell in love with Vietnamese food during my stay in Saigon. that stay made me wanna learn a bit more about cooking, it is funny it happened to you while in Italy.